Sports Fishers | Hardy Buoys Smoked Fish Inc.
Bring us your catch; you will be glad you did! So you caught the big one! Now what are you going to do with it? Bring your sports caught fish into Hardy Buoys Smoked Fish Inc. to be custom processed. Whether you have your catch smoked, filleted and flash frozen or a little of both, at Hardy Buoys you really do bring your fish in and let us do the rest! You put a lot of time and planning into your trip. Now that you’ve caught the big one – don’t let it get away. (Quality that is!) You caught the fish, now the rest is up to us. Hardy Buoys can make arrangements to have your catch picked up at the airport, a local campsite, or even a fishing resort anywhere on Northern Vancouver Island. We suggest phoning in advance to pre-arrange any of these services 1-877-949-8781. You won’t have to waste a minute of your holiday transporting the first few days catch. If required we can transport back to your location once the order is finished. 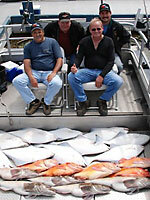 Have your fish cut and vacuum packaged, smoked or just flash frozen. Let our expert staff customize an order that is best suited to your specific instructions, and travel requirements. If traveling home with your fish is not convenient. Hardy Buoys can help with your shipping arrangement. Don’t hesitate to call ahead and discuss your plans with us. We’ve been looking after the needs of the sports-fisherman since June 4, 1994. Give us the opportunity to look after your fish and you will see why our customers just keep coming back year after year. Read the testimonials and see what others have to say. At Hardy Buoys we guarantee three things, excellent service, fair prices, and a great product! Bring us your catch; you will be glad you did!